If you're interested in upping your eco-friendliness, here are 10 simple things you can do right now to make your home more sustainable. Every year, Americans throw out nearly 180,000 tons of batteries — most of which are single-use. These disposable batteries may be more convenient, but they're also more wasteful and toxic to the environment. By using rechargeable batteries for your electronics, you'll contribute less waste and save money in the long run. And when you need to dispose of rechargeable batteries, don't forget to recycle them instead of tossing them in the trash. The average American household has more than 40 lightbulbs, with lighting accounting for as much as 14%of residential electricity usage. 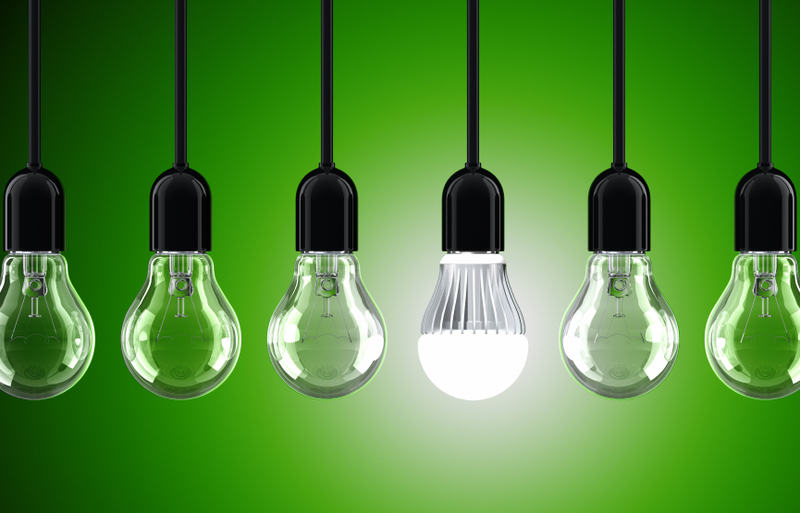 A quick way to make your home greener is switching to energy-efficient bulbs. Halogen incandescents, compact fluorescent lamps (CFLs), and light emitting diodes (LEDs) use 25 to 80 percent less energy than traditional incandescents and can last up to 25 times longer. Leaky faucets, broken toilets, misbehaving sprinkler systems, and other similar issues waste an estimated 1 trillion gallons of water nationwide each year. To help prevent some of that waste, conduct a water audit on your home by checking the toilet tank, inspecting your washing machine, and monitoring your water bill for any charges that might indicate higher-than-usual water usage. If you notice any possible problems, fix them immediately or hire a plumber. Dirty or clogged air filters can damage your heating and cooling systems, agitate allergies, reduce air flow, contaminate air quality, and increase energy usage. To keep those issues in check, monitor your filters' dirt buildup once a month and replace or clean them every three months. Set a calendar reminder on your phone to help you keep to a consistent schedule. Additionally, while disposable filters are more popular and easier to use, consider purchasing reusable filters, as they're more efficient and eco-friendly. Conventional cleaning supplies can contain carcinogens, toxins, and other harmful ingredients that can irritate the skin, eyes, and respiratory system. Some chemical agents can pollute your home's air or make their way into natural water sources after being rinsed down the drain. Replacing standard cleaning products with all-natural cleaners — or making your own using natural ingredients, such as white vinegar, baking soda, or castile soap — is a great way to alleviate some of those problems. You'll improve your home's air quality and help keep the planet healthier. The refrigerator and freezer are two major household energy consumers, so make sure they aren't using more energy than necessary. Keep your freezer at 0 degrees F and your refrigerator between 35 and 38 degrees F. To avoid additional wasted energy, don't leave the doors open for more than a few seconds, and keep both your refrigerator and freezer at reasonably filled but not overstuffed. Crevices and leaks in exterior wall outlets, doorways, and windows result in more drafts, which leads to greater energy usage to either heat or cool your home. Fortunately, there are several simple and inexpensive ways to improve your home's insulation and cut back on wasted energy. Foam insulating pads can plug air leaks in exterior wall outlets, rope caulk can weatherproof window cracks, and weatherstripping improves the seal on doors. Live plants act as a natural air filter for your home, absorbing pollutants and increasing oxygen flow. Certain types of plants — including English ivy, ficuses, and spider plants — are particularly beneficial to a home's environment thanks to their air-purifying abilities. For effective air purification, place multiple indoor plants throughout your home. NASA researchers recommend keeping one potted plant per 100 square feet. Many of us leave electronics in standby mode. Unused but plugged in electronics — also known as "energy vampires" — can add more than 10% to your monthly utility bill. Get in the habit of unplugging all devices you aren't using, including smartphone chargers, game consoles, coffee makers, and televisions. Using a power strip might make it easier to toggle the power flow on and off for multiple devices. Up to half of your home's consumed energy is used for heating and cooling. A programmable thermostat helps you cut down on wasted heating or cooling when you aren't home. Smart thermostats are even more energy efficient, because they can learn your preferred temperatures and adjust when nobody is at home. Plus, with a smartphone app, you can remotely control the system, turn heat off or on, and change the temperature to conserve energy. While a lot of these changes seem fairly small, they can have a huge impact on the planet. But don't stop here — there are plenty of other efforts you can make. Learn more about the eco-friendly benefits of home automation and sustainable living to keep improving the green factor of your home.